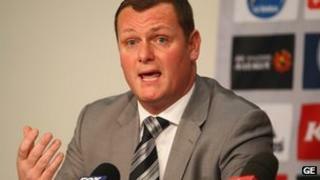 Jim Magilton has been appointed as the new coach of Australian football side Melbourne Victory. The 42-year-old, who was recently interviewed for the Northern Ireland international manager's job, replaces Mehmet Durakovic, who was sacked earlier this week. He recently worked as assistant manager to former Shamrock Rovers boss Michael O'Neill. O'Neill was unveiled as Northern Ireland manager earlier this week. Magilton missed out on the coaching position at Melbourne in the close season, when Durakovic was appointed. However, the A-League side are said to have been impressed with Magilton's performance during the interview process. He received a call from Melbourne after their mid-week defeat to the Central Coast Mariners. "It all happened pretty quickly," he said. "I got a phone call, the opportunity arose and I snapped it up. "I am fearless, I am meticulous, I am astute, I am very much hands on and I like to get amongst the players and be involved in the training aspect of the set-up. "The immediate effect I can have on the team is confidence." It had been thought that Magilton was in the running to replace Phil Brown as Preston North End boss. The former Northern Ireland international previously managed Ipswich Town and QPR. Ex-Liverpool and Leeds United player Harry Kewell joined Melbourne Victory in August. Kewell signed a three year deal after three seasons at Turkish side Galatasaray. The Australia international made more than 300 top-flight appearances in England. Former Millwall and Rangers player Kevin Muscat had taken charge of coaching duties at Melbourne following Durakovic's departure.